Old Irish Blessing: You can’t drink all day, if you don’t start in the morning. This weekend we drank all day, both days at Thomson Vineyards. On Saturday we searched for the reason why green beer flows endlessly around St. Patrick’s Day, but green wine has yet to be invented or marketed. And on Sunday, rather than barrel taste with the masses, we held our own elite blind barrel tasting in Orinda. Here’s a brief time line of what went down and when (including tasting notes)! 8 a.m. – Book it down California Street to catch the appropriately themed 44 O’Shaughnessy bus. Greeted by MUNI driver who waves me by as he bumps beats of KMEL Jams in the drivers seat wearing gold aviators. Yeah, these drivers are over indulged and over paid. 9 a.m. – Arrive in the Mission at 24th Street BART station. Out of my element. Danny Boy dangling from my COACH purse as I emerge from underground into the Saturday Farmers Market, reminiscent of little Tijuana, complete with empanada and tamale carts, police cars, and no sight of Guerrero Street. Where am I?! Settle into my obnoxiously green and very Irish attire; grab my purse and jet up the hill arriving at the affectionately named “Hobbit Hole” just in time for the first round of Irish coffees. 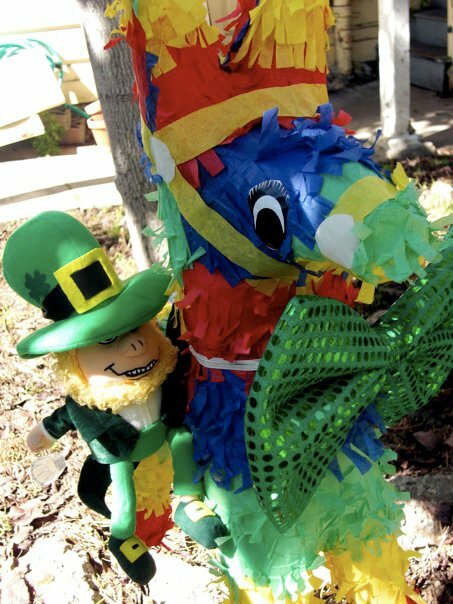 10 a.m. – Several whacks at the Mexi-rish Donkey Pinata, leads to eventual obliteration of paper mache, revealing gold coins and mini bottles of Jameson Irish Whiskey and Baileys Irish Cream! Waxy orange skins. Linseed oil. Leather. 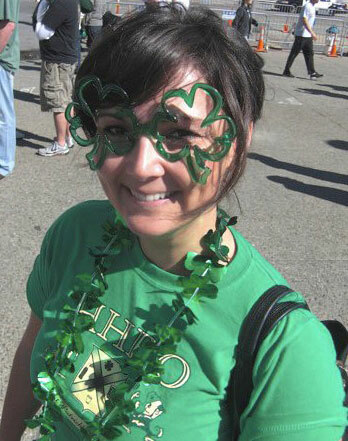 11 a.m. – Stash a few Baileys Irish Cream mini bottles in purse for walk to BART. Classic. Creamy. Lingers on the back palette. Perhaps a bit too long. 11:30 a.m. – While boarding rowdy BART train to downtown Civic Center Plaza, discover I have been left in charge of Guinness rations. Several Irish coffees in and I can still be counted on to be reliable. Awesome. Bitter, burnt, dark-roasted flavors. Reminiscent of coffee. Would pair nicely with a scoop of vanilla bean ice cream. Noon – 4 p.m. – Guinness, more Guinness, SFPD at Temple Bar outdoor block party, Irish reveler offers to buy me a Smithwick’s . Full and smokey on the nose, and has good body but lacks both breadth and depth. Flavor is pleasantly bitter. Who am I kidding, it tasted like beer at this point. Nothing else! 7:30 a.m. – Depart from Napa with The Farmer for his close up and 15 minutes of fame. Tell him, “work attire okay” for this interview with the California Agricultural Communications Commission at UC Davis. He counters, “coveralls?” Denied. Discuss “Faces of Farming” campaign with him, i.e. media training on the go. Sidenote: winemakers, farmers – media training is a good investment. Recommend redirecting small amount of funds going to social media mavens back towards good old fashioned PR. 8:15 – 10:30 a.m. – Drinking Timeout – Interview with AdFarm for California farming promotional campaign; giving consumers insight into California farming beyond the cardboard carton of eggs, the cold case that contains the packaged tri-tip they will throw on the grill later that evening and the overly glamorized wine industry they read about online. 10:30 a.m. – Starbucks 1/2 pump black cherry mocha. Extra shot. Tasting Notes: Sugar.Chocolate. Zero coffee flavor aroma or profiles. Sugar. What black cherry!? Sugar. A Nice nose. Needs oak. High Malo. Apple. Most complex blend of flavor notes in the nose of all samples. However this winemaker achieved this – it’s very nice. B Sugar. Alcoholic fermentation possibly not completed. Nearing noble status. C Distinctive Chardonnay. Light. Classic. Crisp. Mineral. D Yeast on the nose. Light. Classic. Substantial, yet pleasant finish. E Mineral. Light. Classic. Smooth butter. G High SO2. Sharp nose. Light color. H Pleasant nose. Butter. Balanced acid/fruit/minerality. I Burnt popcorn butter. Balanced, but distracting on the front. J Classic. Mineral finish. Would pay $30-$40/bottle. 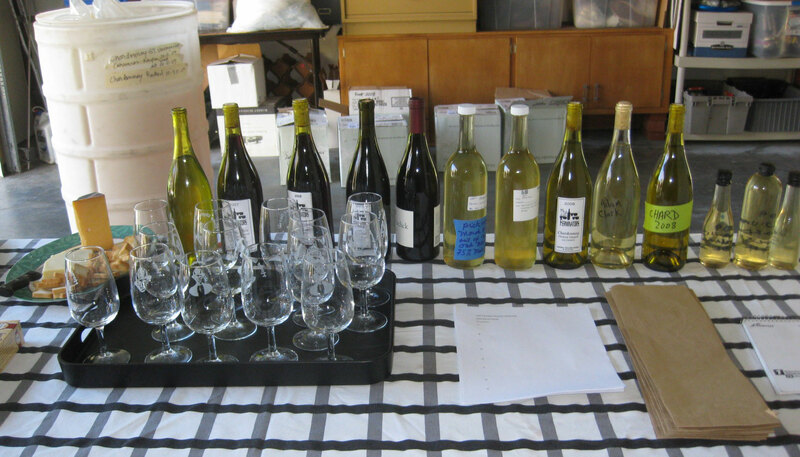 4 – 5:30 p.m. – Vertical Pinot Noir tasting commences (2006-2009). Miraculously I get every vintage right, upon bottle reveal. Apparently pre-gaming on Saturday has allowed me to focus better at the Big Game on Sunday. LiquidLuv Napa winemaker vs. Undisclosed winemaker championship round occurs. No competition. The Merlot fruit is king. Short wrap up on Thomson Vineyards Chardonnay fruit characteristics: Mineral and acid. All other flavor profiles contributed by winemaker, barrel, yeast, etc. Pricing run-down. Check, check. Sales strategy approved by RockStar Local Celebrity – The Farmer. 7 p.m. – San Francisco H2O Tasting Notes: Cool. Refreshing. Hint of lemon. Hydrating. « Where Were You in 1976?